The weather changed for the better this week. 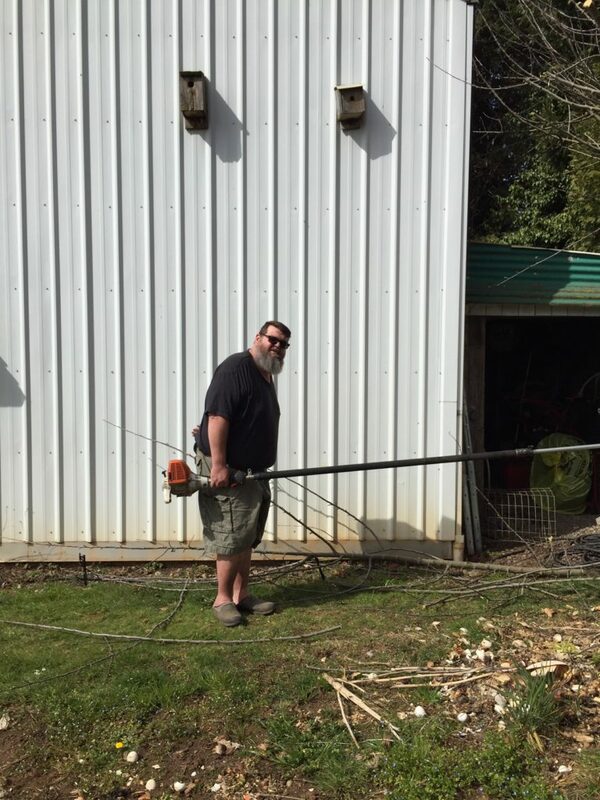 Rob was able to take his saw on a long pole and attack the apple tree. It was so tall from years of not being pruned that most of the apples were unreachable last year. 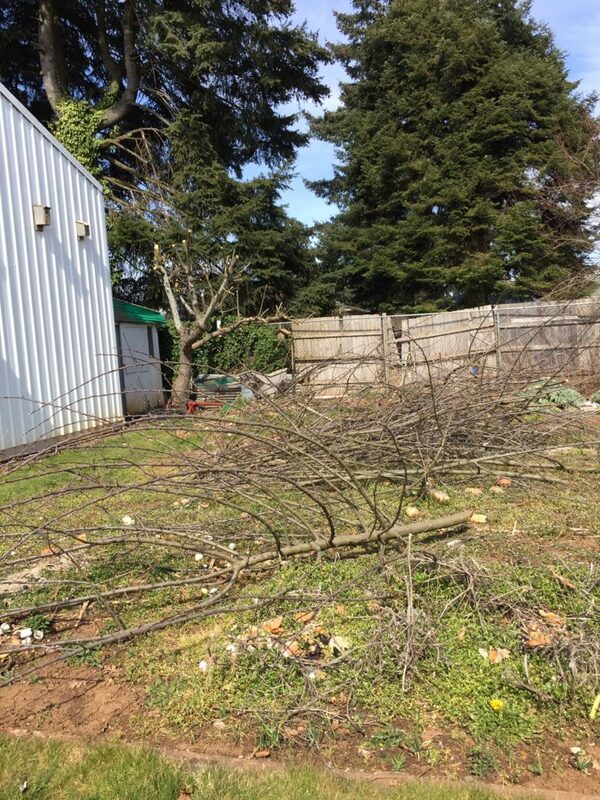 He stood in one place and severely pruned it while I hauled the branches away into the garden where they will be further broken down and removed over time. You can see that most of the tree ended up in the garden. Now, it has a chance to re-grow. We did notice that the trunk itself is quite rotten, so we are not sure it it will live for long anyway, but it now has a chance to be useful for a few more years. I will admit that I was a bit stiff this morning, but it feels so good to get stage 1 of a big project done. Rob found more free boards and we cut them up for fire-starting. It’s nice to not have to skimp on the boards because they get the fire going so easily each morning. Today was the first day since last fall that we did not build a fire as it was quite warm here. I know we have many more “fire-building” days this spring though, so it’s great to have more kindling. I received the southwestern beans and the oat milk for free when I did my shopping. 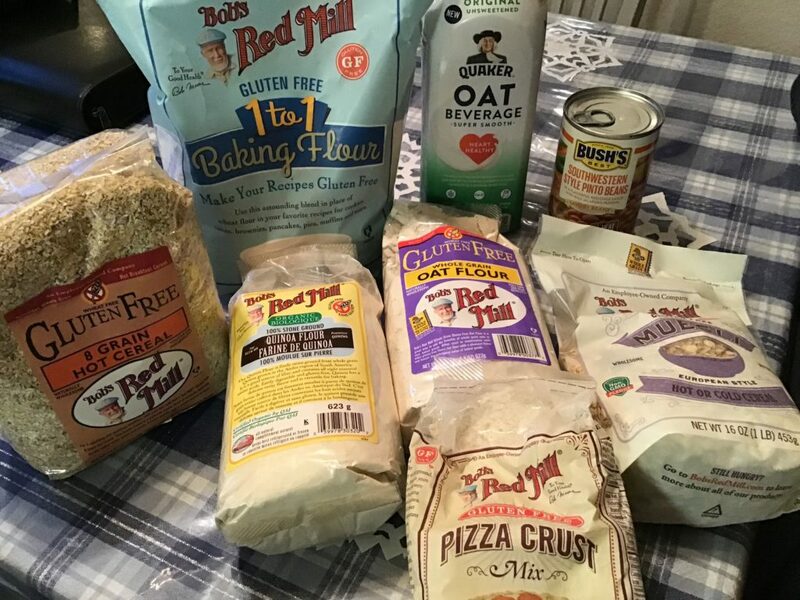 All of the gluten-free products were a gift from friends. Wow! It was so nice of them to think of us. We really appreciate it. I did quite a bit of grocery shopping this week. I am getting the camper ready for camping, as we will go later in the month. I always keep a good pantry out there, but there are always things I’ve completely cleaned out at the end of camping season that need to be replenished every spring. There are also things I’ve “robbed” throughout the year when I run out of an item in the house. One thing I did was empty the little freezer out there, and used a bunch of the items that had been in there since October. We save a lot of money by stocking the camper well. Little stores in small towns are usually what are found near campgrounds, and are generally much more expensive than what I can buy food for on sale at my regular stores around here, so we just buy a few items if we really need them while we are camping. I got 2-lb bags of shredded cheese for $3.99 using a digital coupon. I bought 5. The biggest bargain was some Tyson frozen chicken breasts Rob scored. I had been to Fred Meyers looking for the 5-lb bags that were in the ad for $9.99. I had a $2.50 Ibotta rebate on them, which would have made them $1.50/lb, a really good price around here. They didn’t have any. Rob called around, found some at a different location, and went to get them for me. When he got there, the meat manager said she had WAY too many and was going to mark them down for him. To his amazement, she marked them down to $4.99/bag, and said he could take all he wanted, she needed to reduce her inventory! He took 12. I could do the rebate on 5. When all was said and done, it worked out to about 79c/lb. Amazing! We are going to can some, as we’ve used a lot of what we canned last summer. We are also on the schedule to feed the college group at church in early April. They will get chicken! Their group has a budget for these meals, and we will certainly be able to stay under it this month for them:). I used our YMCA membership 2 times this week. 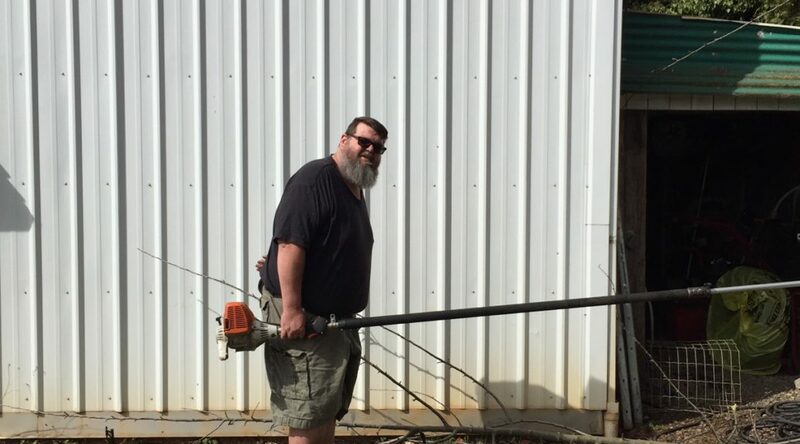 I got lots of free exercise working in the yard. We wanted to do something special with Patsy on Friday after school, since we’ve been spending so much time with my niece and nephew. We didn’t want to break the bank, but still wanted it to feel special for her. So, first we took her for a haircut at Supercuts (one of those walk-in inexpensive salons). I have many talents, haircutting is not one of them. Ask any of the 8 children. Then, we took her to Safeway, where I got round 1 of my groceries and we bought chips. We also let her have all of the Monopoly tickets, as she likes opening them and putting them on the board. While at Safeway, we bought some nail polish remover and a new bottle of polish and rented 2 Redbox movies. At home, we watched the movies, painted our nails (except Rob, who declined the offer), and ate chips (except Rob, who declined that offer, too). Then, I let her enter all the Monopoly 2nd chance codes into my phone, something I’ve never wanted to do before, but she did, so it was a simple fun activity for her. She earned some reward points, which didn’t amount to much, but I’m glad she had fun. The next morning we took her swimming for a little bit, and when Rob went for the chicken, she went too, and he got her some ice cream. I think she enjoyed her weekend. I’ve been reading and catching up on all your recent posts! You’ve had a lot going on, haven’t you? I’m hoping Jake is feeling better, now. Wow, 7 teeth out at one time? That’s a lot! The most I’ve had extracted at one time were 4 wisdom teeth! Even one extraction hurts! I can’t imagine 7 extractions! Some of Jake’s teeth were baby teeth and some were permanent. There just isn’t room in his mouth for all of those teeth, and they are hoping this helps. Sounds like you had a great week. Glad Patsy was able to get some quality time with you and Rob. Rob is looking thinner and thinner . If you smoke meat, apple wood is great for it. It produces a wonderful flavor. Great score on the chicken. I think Rob plans to fix some of the branches to give away to some of his friends next Christmas. I think he plans to somehow use one of his big shop tools to break some of it down into the correct size/shape for them to use it for smoking. I thought some of the branches would look cool tied together like a teepee and plunked in the garden for some kind of bean or flower to climb up. I guess we will see what we end up doing with the branches in the end. I know the yard debris bin can only take so much each week, and it’s full to the brim this week with 1/2 of a rhododendron bush Rob took down for me on Saturday. I want to plant a blueberry in its place. I stuffed all the corners and spaces with ivy–it’s taking over some places again. It is pretty, but a huge nuisance and will re-root so easily that I don’t dare put any of it in the compost pile for the garden. Just as soon as they take the bin away tomorrow morning, I plan to fill it up with the rest of the rhodie and some more ivy and maybe a few of the smaller apple branches. I’ll see what I can get done. Good luck with the ivy. Thankfully we don’t have any. My sister had some at her old house and it would take over. Blueberry bushes will be a great addition. We just got 40 raspberry canes free from Craigslist. Hoping we both get lots of homegrown berries. I love raspberries! I have some that were here, and some that I nursed along from property to property from my childhood place. I think I will get a larger crop this year. Depending on which kind yours are, you may get some this year, and maybe next year. There are 2 blueberry bushes here, but the berries are small and not very sweet, so I’m hoping to get some large, super sweet ones to add to the mix. What a blessing to get all that chicken for such a great price! I have been watching for an opportunity to use that iBotta rebate but have not seen one yet. I am sure the apple tree is breathing a sigh of relief not having to support all that extra growth. Hubby cut back all the border grasses here last week and I am glad to have that chore checked off the list. Hopefully it will dry out some here so that we can get other outside work done. I know you have the same issue this time of year but it is good to get all the rain going into Spring. I think we are going to have a couple more nice days, and I hope to find time to get out there and do some more yard work. Then, typical rain, as is usual in the spring around here. If I could get a corner of the garden to be dry enough, I would plant lettuce, carrots and beets out there–I’ll see what the weather does. Here’s hoping! We were on the same page this weekend, severely pruning back a large mulberry that had gotten too tall to harvest from. Here’s hoping we both get rewarded with lots of fruit. Though not nearly as impressive as your chicken score, I needed milk and buttermilk, and found both on manager’s special at half price. I’m not sure why, as both were more than a week from expiration. Maybe, like your score, they just had too many, though it’s hard to imagine milk would be in that category. Around here, the $2/lb is a good deal. So, you can imagine that Rob was so happy with himself for finding that deal! There seems to be no rhyme or reason to some of the things on the bargain rack around here, too, and sometimes when things that are way over the hill remain at a higher price. Go figure! I’m glad you got some pruning done, too. 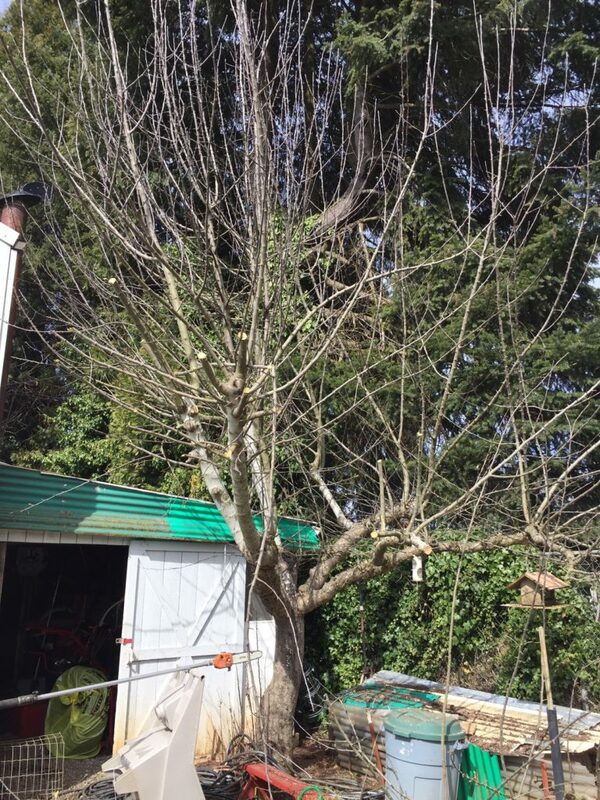 We don’t have mulberry trees around here, so when you said that, all I could think of was the old song, “Here we go ’round the mulberry bush.” All kidding aside, I have so much more pruning to do it’s crazy. This place is getting quite overgrown. So we figure we will choose one or two outside projects, finish them, then move to the next one. I’m not at all sure we can finish this year, especially since Rob’s having such a hard time with his hip and there’s so much to do. He did ok staying mostly in the same place and letting me drag around the branches, but he is still very sore still today. Wow – what a great price on chicken and the gifted gluten free stuff. Your special time with Patsy sounds perfect to me! I’m sure she enjoyed it too. You and Rob have done so many good things for others that it is now your turn to receive something in return. Like I tell my daughter and her friends, “What goes around comes around.”. Do something good for someone and eventually that good deed, no matter how small, will come back to you. Rob does look ALOT thinner. Losing weight is hard so congrats to him. And kudos to you in supporting your husband in his endeavors of weight loss. I haven’t mentioned Rob’s weight-loss journey lately, because he’s been STUCK! Finally, after about 3 weeks or a month of just keeping on, he’s finally dropped 6-7 lbs again just lately. I’m so happy for him–he was getting discouraged because he was behaving! He really can’t exercise much at all–the pruning was very hard for him, but he stayed in one place as much as possible while I dragged the branches, and he sat down for a while in the middle of the project. His hip is getting worse and worse, despite the dramatic weight loss, and getting up and down hurts the worst. They encourage him to spend time laying flat to take pressure off the hip, which drives him crazy as he doesn’t like being alone in the back room staring at the ceiling! But, I’ve been proud of him–he’s gotten prayer lists from the pastors at church, friends, and family and is using part of the time praying extra. He also watches U-Tube on his phone and finds interesting things to watch, such as people finding artifacts from the Civil War, using metal detectors, and so on. It’s not riveting, but it’s something to do. Becky, I live close to many Civil War battle sites. If there is somewhere that Rob wants me to visit to take pictures of or something, I will be willing to do it. When I homeschooled the boys we studied the war by reading people’s diaries. They told an entirely different history than what is recorded in the textbooks. He would love to know anything you know and see any pictures you’ve got! Sheesh! At my first chance to sit down and rest, I clicked on your blog to see something interesting and what befell my eyes? More tree trimming! Uhg! Can I not get away from fallen branches everywhere? The bodock trees we have cut down and are trying to burn (every free minute of the day) are multiplying in the dark, haunting my brain and causing insanity! Well, at least you got an awesome deal on chicken. That is something to celebrate. I think these apple tree branches are going to be much easier to get rid of then those awful trees you have to contend with! It has been so lovely the past couple of days that I now feel an urgency to get them out of the garden so my garden is free, but reason prevails—I’ve got time! Rain is coming back, and it’s too early for most of the veggies around here:). Good luck burning those branches. I don’t think I can burn mine, although that has always been the solution in the past. But, we live in the city now. So, it’s one big pile of branches, and one lonely yard debris bin for us. Ugh, not Uhg! I can’t even spell a three letter word! I am so embarrassed. Just blame it on spell check!! Yes, spreading out the personal time when you have so many children around can be difficult. Children are usually easily pleased with special little adventures. Patsy seems like such a sweet girl. Glad she got her special time too. I feel like I need to keep making sure she gets her piece of the pie–it’s always been a difficult thing to do–8 kids is no joke, then add in all the cousins over the years–whew! We had a number of neglected apple trees on our property when we moved in about three years ago. Hubby has been pruning them back each winter and we are starting to get fruit on them again, there were a few apples on them last year. Hubby put in another couple dozen fruit trees and berry bushes as we have the room and love the fresh fruit. Our blueberry bushes were neglected as well and he has been pruning them each winter and applying leaf mulch around them as well. We got over 100 quarts of large juicy berries this last summer. Well worth the effort. I empathize with your lack of hair cutting skills. My two boys got repeated bad haircuts at the barbershop and I bought a good set of Wahl clippers and watched the Youtube videos with my then fiancé, I was ready to go. Well I started on my younger son first, but got flustered and had my guy finish, older son started out ok, but handed off to have him do the scissor and comb cutting the longer hair on top and to blend. Both looked great, but next time older so told me no, I wasn’t going to cut his hair, he wanted my guy to do it, so he said ok, younger son followed his brother’s lead. I was fired. Good news is hubby still does them monthly, he cuts mine every other month and I save hundreds a year. Hubby fized a bad salon haircut for my mom and a couple months later she was at the house for me to color her hair and mentioned she needed a trim. I offered but she replied with a firm NO! My mom rejected my offer, no one will let me cut their hair. My mom was watching hubby cut the boys’ hair and commented he does a great job, but looks like too much work, she would just buzz them, I agreed and my older son reminded me that is why he will not let me cut his hair. Mom took a seat and told him she wanted him to use the maroon stylist cape on her, not the white barber’s cape he used with the boys. She is not one of the boys. He laughed and told her not to worry, he is not going to use the clippers on her hair. So luckily hubby does haircuts well. With eight kids you barbershop costs must be over a grand a year. Is your husband handy with the clippers and shears? If so it could save you a lot of money. The reason we are taking Patsy to a hair salon is because she has just enough curl in her hair to make it hard for him to get it right. The first 3 girls and 2 boys had straight hair, girls # 5 and 6 are African American and that’s a whole different story, and then there’s Patsy–the only one left at home now! (I occasionally did trim the African-American hair over the years–just cut a tiny bit off the bottom). I did, however, learn to do corn rows and twists and some other styles for the curly, curly hair, under the direction of a couple of people who helped me along the way. Once Lovana got around 14, she chose to get her hair relaxed, and earned the money for that herself. Yes. It cost a fortune. Ja’Ana left hers natural and it still is, and Lovana has returned to natural over the past few years. I’m glad they did, because the treatments Lovana got caused hers to break off so badly. That is funny, but yes both had similar experiences. I watched the videos and I thought it would be great bonding time with my sons, I would be a great mom who does their haircuts and they would want their mom to be the one who cuts their hair and they would look great and be appreciative. It looked like fun in the videos and I was looking forward to cutting hair, I think all women enjoy it to some extent to feel creative. Seeing hubby cut my mom’s hair was kind of a mixed feeling, I wanted to do it for her and have that time with my mom, but at the same time hubby is really good at cutting hair and I do want my mom to look her best. So me giving her a mediocre (or wonky) haircut or hubby doing a great job and mom having a smile on her face, there is no contest. And I have watched him cut my boys’ hair and also my best friend’s hair, and he does a great job. He is very focused, and meticulous in making sure that he does each haircut right. So my handsome boys are going to school with great looking haircuts and my best friend raves about what a great job he does on her hair, so I am a good mom, good daughter and friend who shares, but doesn’t screw up anyone’s hair. I save a lot of money and I call that a win. Rob is looking great! I’m sorry the weight loss isn’t helping his pain though. Does he need to lose much more weight til he can have surgery? That looks like a huge apple tree. Glad you were able to get it pruned. Great deal on the chicken!! Oooh camping season! It will probably be June before we can go, and I’m afraid that I am getting too old for our popup, but I surely treasure the trips and memories. Camping works well for me because we have such a comfortable camper:). With a restroom, shower, kitchen, heater, soft bed, and a roof to keep off rain! So, I admit, I’m a bit of a wimp anymore. We used to do the whole tent thing, but it’s not fun for me anymore in the rain! Rob needs to lose about 30 more pounds before they will do the surgery. Of course, it’s getting harder to lose, but he is still working hard.